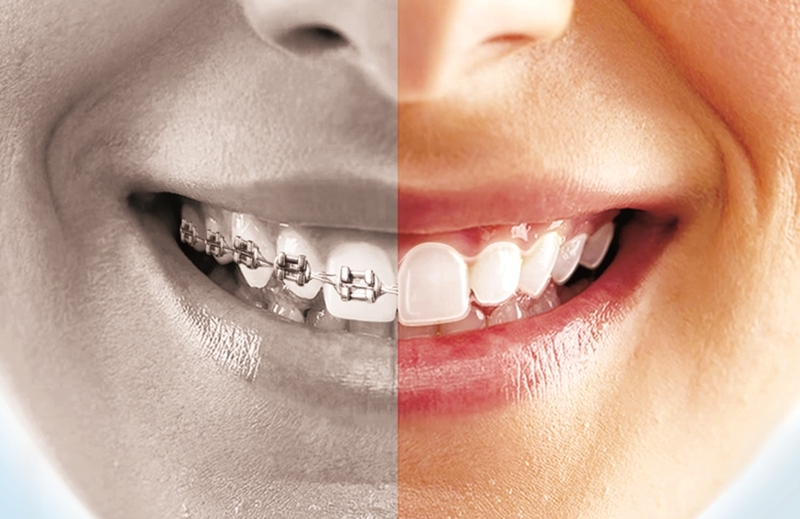 Braces call attention to your mouth and subsequently the condition of your teeth. Braces can also result in permanent discoloration of teeth. Braces are bulky, sharp, and can irritate the interior surfaces of the mouth. Tightening and adjustments to braces results in root and gum soreness, leading to discomfort, especially in the days immediately following an orthodontic visit. Braces complicate oral hygiene by making it difficult to brush and floss. These problems can result in tooth decay and periodontal damage. Additionally, the bonding of brackets to teeth can cause permanent markings on the teeth. With braces, you need to avoid hard, sticky, and chewy. Hard foods can break or damage wires and brackets. Broken brackets lead to delays in your treatment progress. Sticky and chewy foods can get caught between brackets and wires, making them difficult to clean. Braces typically cost between $4,000 and $8,000. Clear Aligners are invisible – SnapCorrect™ Truly Invisible Aligners™ are the clearest on the market. SnapCorrect™ Aligners have smooth edges that do not irritate your gums and cheeks. Since clear aligners are removable, cleaning is a snap! Simply remove them and clean while you brush your teeth. Invisible aligners are removed when you eat, which means there are no changes to your diet – Bon Appétit. If you pay up front, your entire orthodontic treatment will cost you $1749.00. Financing options of up to 60 months are also available. Braces may straighten your teeth, but at what cost? Not only are they uncomfortable and difficult to clean, but they are unsightly enough that some people even stop smiling, to avoid calling attention to their teeth. Imagine the irony of not being able to smile while you are doing something that will eventually make you want to smile more. If even teens find braces difficult, an adult certainly would, too. Compare those difficulties to an invisible aligner treatment. Unlike braces, invisible aligners are barely noticeable. And SnapCorrect™ aligners are the most invisible in the industry. With clear aligners, you’ll keep on smiling while straightening your teeth! Take the Free Online Assessment and receive a FREE Teeth Whitening Pen! We understand that taking the first step towards a new smile can be a little intimidating. That is why we take the worry out with our no-risk guarantee. After sending your Impression Kit back to us, our trained professional dental technicians will determine if aligner treatment is right for you. If it turns out that aligners will not work for you, we will offer you a full refund on the impression kit. That is our Truly Happy Smile Guarantee™. © 2019 SnapDent. All Rights Reserved.